Script Uncle: Developer games - how do they work? Developer games - how do they work? If you're going to a developer game you might wonder how they differ from other kind of programmer pastimes like Hackathons, Programming competitions, just having a beer, talking and so on. 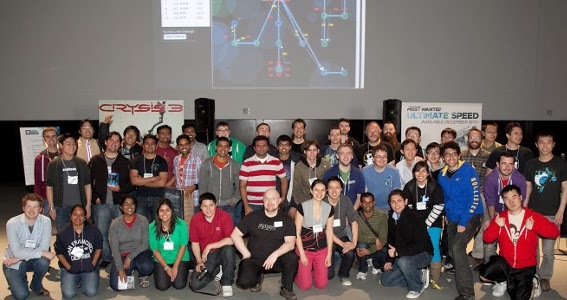 A developer game is a combination of a programming competition and a computer game, where the challenges focus on the practical and fun rather than on algorithmic obscurity. There are some algorithmic challenges from time to time, sure, and they can be quite tricky too. But the core concept is to have a welcoming, inclusive, little bit crazy event which you can attend to have fun and maybe win some prizes, but it's totally up to you and your team. OK, so that's the overall picture, how does it work in practice? All my 'Escape from /dev/null' developer games have taken place with everyone in the same room, or at least building, so that it's easy to ask questions and to interact with other people during the event. When you arrive in the morning, you get login details to the game system and a reserved place to sit with your team. Then comes a general presentation about game mechanics, rules and how to play it in general, and then the system opens and off you go. 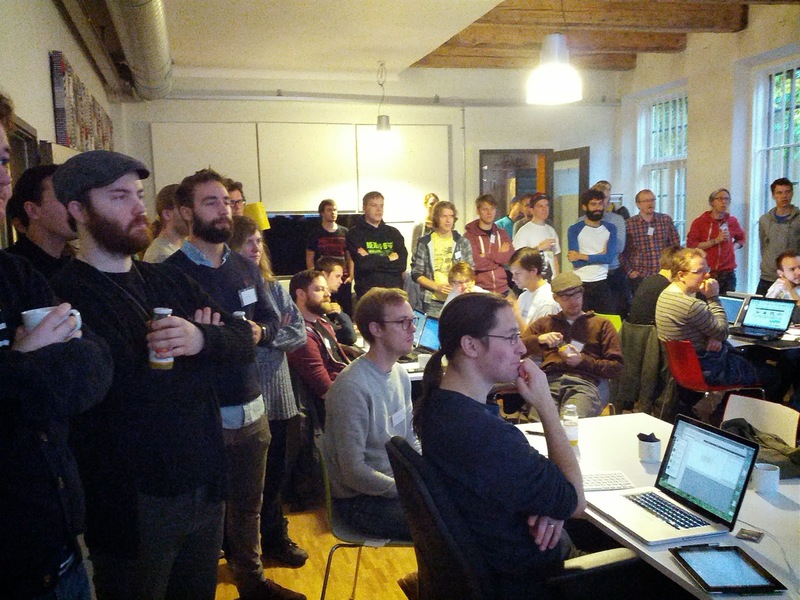 To the right is a picture from the presentation at a game I did at Valtech in Stockholm a year back or so. The red text icons are team markers so that everyone logged in to the system can see where all other teams are on the map. All teams begin at the same (or similar) location and can choose different paths to traverse the game-board to (hopefully) be the first team to snag the prize and the final node. The nodes are the numbered circles and each node contains a programming challenge. Some nodes also contain prizes, so that the first teams to reach a node get the prize it contains (until there are no more prizes left on that node). 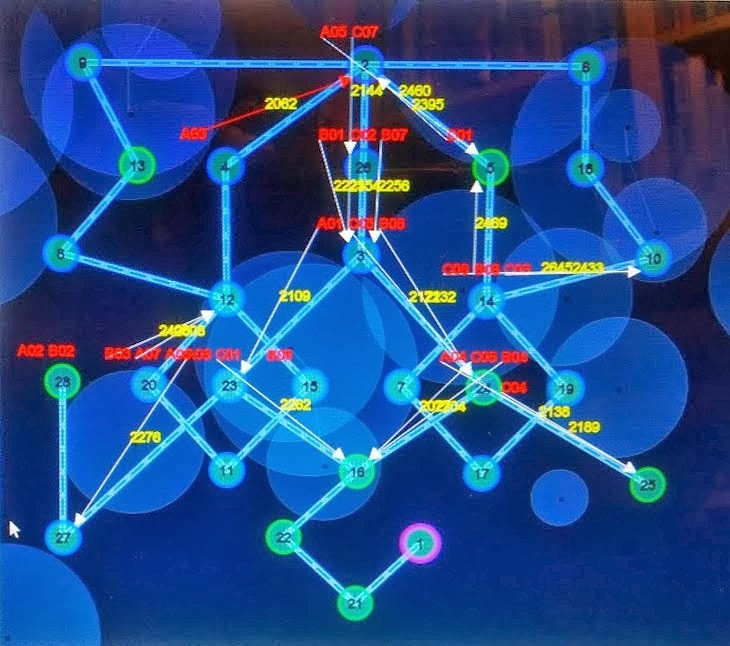 You can also see which nodes the teams are solving at the moment (white arrows) or if they have submitted a solution to the judges (red arrows) and how many minutes they have spent solving the problem (yellow numbers). The above game is an old game I've taken up to take a screenshot of, so the minutes numbers are quite huge, which is not normally the case. OK, so say that your team gets a challenge, what does one look like and how does it work? I won't show you an actual challenge, but I will say that the challenges are thematic and most of them revolve around using a live web-based API where the inner game can be accessed. 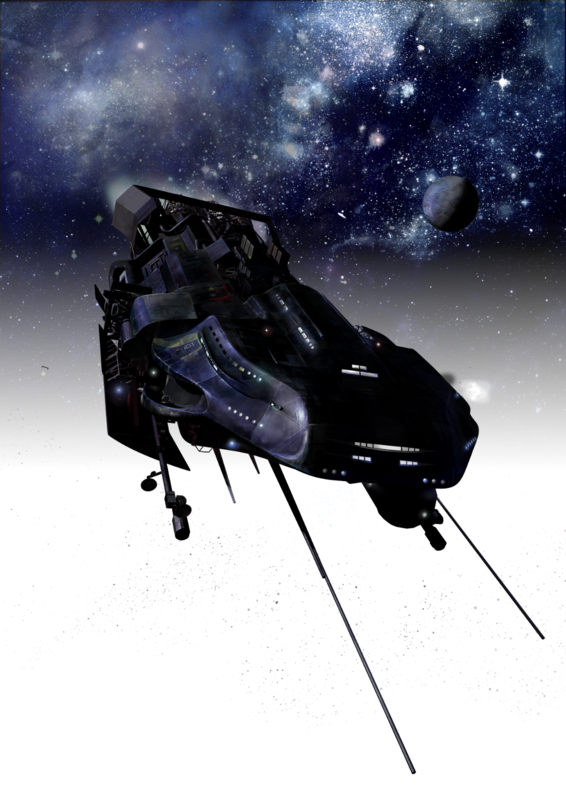 For example the inner game can be (and have been) a multi-user space simulation where the team build a system one challenge at a time which controls a starship which can explore solar system, mine them and repair or build new things. The current inner game scenario is a multi-user rogue-like dungeon crawler, however. If you have ever played games like rogue, nethack, angband and the like, you know more or less what to expect - except it's in realtime, so monster do move even when you are not. So let say that your team have solved a particular challenge, using the web-based interface you will then send of a short message to the judges who will then stroll down to your table and check out your solution. If they spot a mistake or something that you've forgotten to do, the decline the submission and you have to give it an extra go or they accept the submission and your team is moved to the node which challenge you solved and you're free to choose a new one. 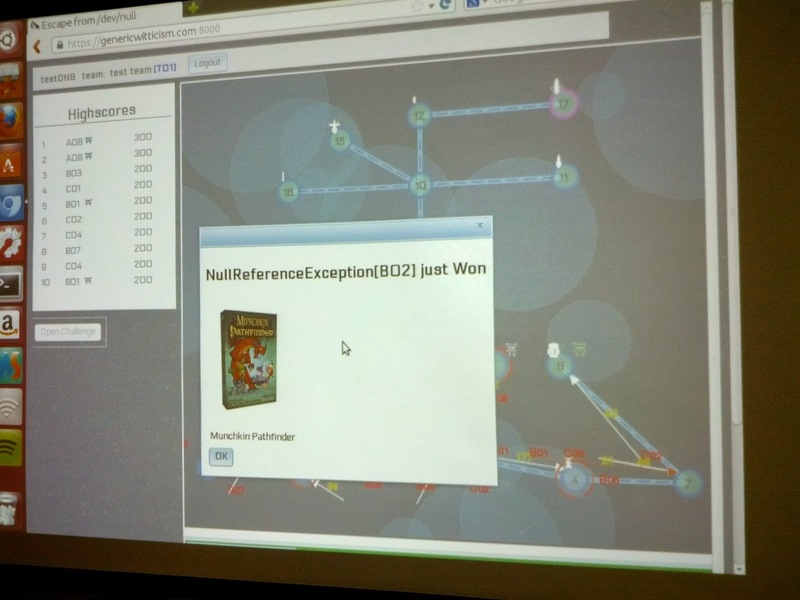 To the right is a blurry picture (I am so not a photographer) of what it looks like on everybody's screen when a team win a prize on a node. You get to name your teams as you sign up and these guys decided to call themselves NullReferenceException (and was randomly assigned team code A02). Another team in the same recent game called themselves "; DROP TABLE INFORMATION_SCHEMA; --", which was very optimistic :) I'm running Couch on the node.js back-end. But the judging part takes us to the question of how and why the developer games exist at all. To fly all over the world setting these things up (not to mention buying prizes) costs a bit of money, so all events need sponsors. And the whole reason I started doing these events was that I was so frustrated and dissatisfied with how development branding works when it comes to programmers. A lot of the communication is often done by a non-programmer who can't really represent the company properly and tend to brush programmers the wrong way. What I would like companies to do (who absolutely depend on programmers) is to have more laid-back communication between their programmers and the actual programmer communities, and any evaluation should be done as respectfully and nicely as possible - and the best way I could think of was to create a cool, geeky and unique kind of game where programmer (the judges from the sponsor) meet programmers (the attendees) in a natural way. The judges check out how you code and you get a chance to ask them how it's really like at the company they work for - if you want to. Many people just show up for the game and isn't really interested of the sponsor at the moment, but in a year or two that may change, and now they know who to contact.